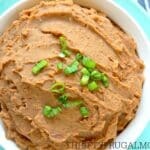 Learn how to easily make homemade refried beans in your Instant Pot! They take just 30 minutes to cook and are delicious and cheap! Also includes instructions for making refried beans in your Crockpot as well. For years I had this love|hate relationship with refried beans. I loved them because they are an easy, cheap protein that can be served in so many different yummy ways, but I disliked that the store bought ones contain unhealthy things like partially hydrogenated lard, which I prefer not to consume. One day, I suddenly had this realization that, hello?! Refried beans really couldn’t be all that hard to make, right? So I did some research, started experimenting and sure enough– it was really quite easy to make my own homemade refried beans, especially once I started using my Instant Pot! Not only are homemade refried beans incredibly easy to make, they are also just as good, if not better tasting, than their canned store bought counterpart. Plus you can happily eat them knowing that they contain only normal ingredients that you regularly have in your cupboards. The other thing that I love about this Instant Pot Refried Beans recipe is how cheap it is to make. I can get a 2 lb. bag of pinto beans at Aldi for just $1.49. Assuming the rest of the ingredients costs $0.51 (which is a pretty generous estimate), my total cost is just $2.00. 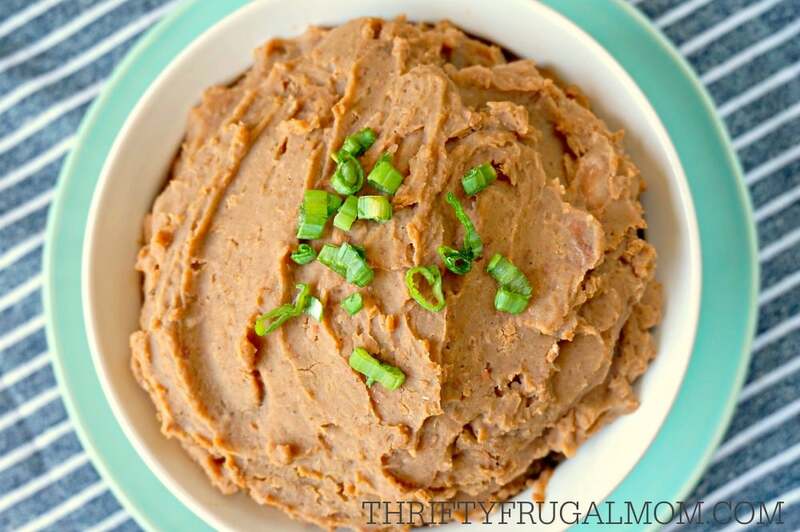 That means that I can make these Instant Pot Refried Beans for just $0.40/can. That’s almost half the price of what I’d pay at Aldi, where refried beans cost $0.79/can. And much less than I’d pay at a regular grocery store! I used to make this recipe in my Crockpot, and while it worked really well, it took much longer and I found that part unhandy. 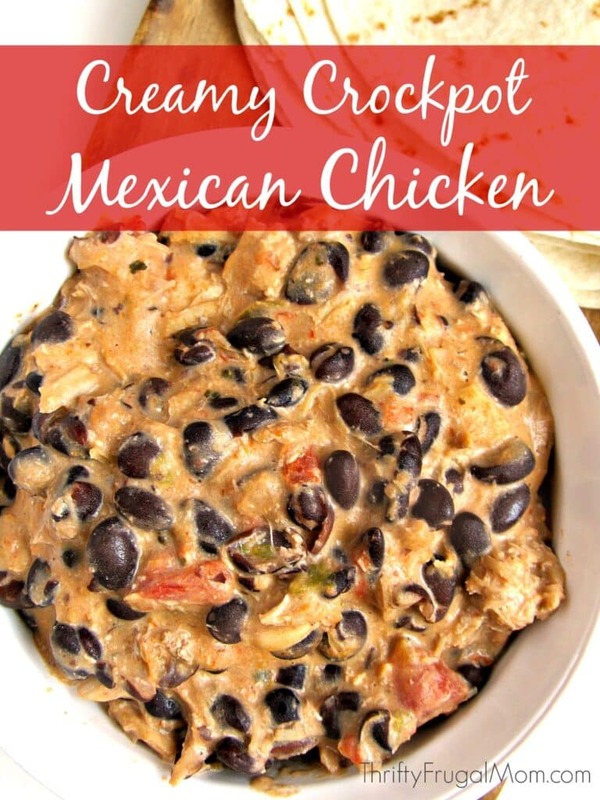 So when my husband gifted me with an Instant Pot last Christmas (this is the one I have and love), I knew that one of the first things I wanted to do was figure out how to adapt my refried beans recipe so that I could make them in the Instant Pot. I love how much faster it is and it’s the only way that I make them anymore! But if you don’t have an Instant Pot and still want to try this recipe, I’ve included the Crockpot version in the Notes section of the recipe too. 1 tsp. lemon juice opt. Sort and rinse the beans, removing any stones, dirt and shriveled beans. Dump the rinsed beans into the Instant Pot (this is the one I have); add water to cover the beans plus approximately an additional 2 inches. Let set 8 hours or overnight. Dump beans back into the Instant Pot and add the remaining ingredients. Put on the Instant Pot lid, making sure that the vent is turned to "sealing". Mash beans using a potato masher or blender. (This hand blender is what I use and it makes so easy!) Beans will appear quite soupy, but will thicken up a lot as they cool. If you follow this recipe exactly, once cooled, your beans should be about as thick as store bought canned refried beans. If you prefer a thinner consistency, simply mix in a bit of water until you get the desired consistency. Beans will store in your fridge for 1 1/2 weeks or you can freeze them, too. * Alternatively, you could use 3 tsp. granulated garlic or 2 Tbsp. garlic powder. ** I prefer soaking the beans before I cook them because it makes them easier for our bodies to digest, allowing us to get more nutrition from them. It also helps reduce gassiness that often goes along with eating beans. However, if you prefer to skip soaking them, you can. But you will need to adjust both the cooking time and the amount of water added. I would try adding 6 c. of water and cook for 45 min. From what I've read, that should work. Follow soaking instructions. Add all ingredients to Crockpot but increase the amount of water to 6 c. Cover and cook on high for 4 hours and then on low for 1 hour. If you choose not to soak the beans and want to do the Crockpot method, use 10 cups of hot water instead of the 6 cups and then adjust the cooking time to 4 hours on high and 2 hours on low. You may also need to drain some of the liquid off at the end of cooking to get a good consistency. Isn't the Instant Pot awesome for things like this? I never would have dared to make homemade refried beans without it. your version is a tad bit different than mine, so I can't wait to give it a try. Yes! I love how you can put your ingredients in the Instant Pot, set it and then walk away. It's so convenient and has been a huge time saver for me. great recipe! my family loved it and I loved that I didn't have to add any oils or lard! healthy and delicious, many thanks! Just made these. I reserved a third for burrito bowls and blended the other 2/3 into refried. These are really fabulous. I did add some vegetable better than bouillon. My husband said it was the best he has ever had, anywhere. It is what restaurants should strive for, lol. They are kid approved as well. Two of my kiddos love bean burritos for breakfast....and every meal. Thank you for this simple recipe that is waaaay better than all the others I have tried in the past that had many more ingredients. Big win! I'm sitting here blushing at all the praise, Sarah! :) So glad that you all loved them so much. And I really like your idea of saving some for burrito bowls too! Going to have to try that next time I make them.